Today I want to focus solely on in-game momentum, a topic that I'm now more able to much more thoroughly address thanks to Paul from the afltables.com website, who this week very kindly provided me with a dataset containing every scoring and quarter-end event from every game since 2008 - almost 74,000 rows of data. I'm still in something of a data coma, such are the possibilities. I plan to perform and write-up a series of analyses of this data starting today with a review of what I'll call the "burstiness" of team scoring. Burstiness is the physical manifestation of in-game momentum. If a team's scoring comes in bursts rather than accrues at a fairly constant rate across a game, that's evidence that this team had and lacked momentum at various points in the game. Recently I've been posting about a theoretical model of team scoring (see here and here in particular), one part of which is a statistical model of Scoring Shot generation. I started out assuming that Scoring Shots might best be modelled as a Poisson but subsequently switched to a Negative Binomial to deal with what's called the overdispersion in empirical Scoring Shot data. Put simply, empirical Scoring Shot production doesn't quite follow a Poisson distribution, but it very nearly does. That finding already hints at the possible existence of momentum since the applicability of the Poisson distribution relies on the assumption that the rate of occurrence of the event being modelled is constant across time. The Negative Binomial distribution, in contrast, allows for the rate of occurrence to vary. But, for today's blog, I'm going to free myself from the need to make any specific distributional assumptions in relation to Scoring Shot production. I don't want to test whether or not the Poisson distribution is an adequate fit to some team's Scoring Shot production data for a game but, instead, test the far simpler hypothesis of whether or not a team's Scoring Shot production rate is constant throughout a game. In statistical parlance, I'll be adopting a non-parametric approach. Given a set of scoring events for a team in a particular game we can statistically test whether the time between successive Scoring Shots is consistent with the hypothesis of a constant rate of Scoring Shot production or whether, alternatively, Scoring Shot production rates appear to vary across the course of a game and scoring behaviour, as a consequence, might be what's called "bursty". There are a number of practical ways to operationalise the notion of burstiness - indeed, a Google search throws up many references to web pages, papers and articles discussing the concept, its detection and measurement - but I'm going to settle today for an intuitive approach using what's called the "interarrival time", which in our case will be the time between successive Scoring Shots for a team. A team whose scoring is bursty (ie who has and loses momentum at different times) will have periods where the time between Scoring Shots is low relative to the typical time between Scoring Shots for it across the game taken as a whole, and other periods where the time between Scoring Shots is high. In contrast, a team whose Scoring Shot production is unbursty will tend to produce long interarrival times and short interarrival times apparently at random. One way to operationalise that notion statistically is via a runs test (which we perform using the runs.test function in the tseries package in R) where the sequence that we test is the binary sequence representing whether a given interarrival time was above or below the median interarrival time for that team in that game. We use the median rather than the mean because of the potentially distorting effects of very long interarrival times on the mean. A team whose Scoring Shot production is bursty will tend to have clusters, or 'runs', of interarrival times that are below the median and other runs of successive interarrival times above the median, while a team whose Scoring Shot production is not bursty will have fewer such runs. In the context of the runs test, the bursty team's Scoring Shot data will have too few runs, so a one-tailed version of the statistical test is appropriate. (In the current context, a team having too many runs in its Scoring Shot interarrival time data is not of interest.). Before you read too much further, think about your experience of AFL teams and games and make a mental note of the teams whose scoring you think is most and least bursty and how often you think bursty Scoring behaviour occurs during a game. For the table at right I performed the statistical analysis described above to compare the observed Scoring Shot behaviour of each team in each game with what we'd expect had those Scoring Shots been generated by a process with a constant rate of Scoring Shot generation. Note that, for the analysis, I ignored the quarter-time breaks, effectively assuming that each game was played start-to-finish without a break. It's hard to say what the effects of this assumption are likely to be, but I doubt they're large. Certainly there'll tend to be a larger than average gap between the last Scoring Shot of the previous quarter and the first of the current quarter because the ball gets dragged back to the centre of the ground. Looking first at the block on the left of the table we discover that Fremantle, Collingwood and Geelong, are the burstiest teams in AFL across the period, though even they only manage to exhibit bursty Scoring Shot production in about 15 to 20% of games. When playing at home (which in Finals means they were the team finishing higher on the ladder) Fremantle's Scoring Shot production has been bursty enough to reject the null hypothesis that it can be adequately modelled as coming from a distribution with a constant rate about 1 game in 6. That's a little over 1.5 times the rate of home-ground burstiness exhibited by teams generally (and recall that I've used a 10% significance level). Fremantle, Collingwood and Geelong, are the burstiest teams in AFL across the period, though even they only manage to exhibit bursty Scoring Shot production in about 15 to 20% of games. When playing at home (which in Finals means they were the team finishing higher on the ladder) Fremantle's Scoring Shot production has been bursty enough to reject the null hypothesis that it can be adequately modelled as coming from a distribution with a constant rate about 1 game in 6. That's a little over 1.5 times the rate of home-ground burstiness exhibited by teams generally (and recall that I've used a 10% significance level). When playing Away, Fremantle have exhibited bursty Scoring behaviour about equally as often. Collingwood, however, has been bursty more often when playing away from home - about 1 game in 5. Other teams that tend to occasional bursty scoring at Home are GWS and Melbourne, while those who are bursty on the road include Port Adelaide and Carlton. Away team burstiness, overall, is just slightly more common than its Home team equivalent. Teams that are rarely bursty at home are the Dogs, Hawks, Crows and Swans, while the teams least often bursty away are these same four teams plus the Dons and the Suns. Next, if we consider how often teams allow their opponents to get bursty, we find that the Suns, Dogs and Blues allow it most often when playing at home, while the Hawks, Swans and Tigers allow it most often when they're playing away . GWS, the Pies and the Dees are especially good at preventing bursty scoring behaviour from their opponents when they're playing at home. GWS, the Dons, Carlton and the Pies are best at preventing burstiness when they're playing away. To give you a sense of what bursty scoring looks like in the context of the runs metric we're using, here's a bursty Roos offering from Round 2 of 2012 when they defeated GWS 28.15 (183) to 8.6 (54). During this game the Roos median interarrival time between Scoring Shots was 145 seconds, but they produced one sequence of seven successive Scoring Shots where the time between them was longer than this, and another sequence of nine where the interarrival time was shorter and that directly followed a sequence of five longer-than-median interarrival times. Another example of a contest where bursty scoring was on display is the Round 8 clash of 2014 between Port Adelaide and Fremantle, which Port Adelaide won 13.16 (94) to 11.10 (76). Here Port Adelaide recorded Scoring Shots with a median interarrival time of 150 seconds and managed to record two sequences of five successive above-median interarrival times and one sequence of six below-median interarrival times. Burstiness doesn't require a large number of Scoring Shots, however, as the Round 2 2014 contest between Melbourne and West Coast exemplified. It finished 4.6 (30) to 18.15 (123) in the Eagles' favour. Melbourne's 10 Scoring Shots formed just two runs - a run of five above-median interarrival times followed by a run of five below-median interarrival times. It's games like this one that force us to think about what qualifies as bursty behaviour. Here, the Dees do seem to have a single burst of Scoring Shot production commencing towards the end of the 3rd and running through to the middle of the 4th term, during which period their production rate is starkly different from what it was for the rest of the game. Is that bursty? Did they have the momentum for this part of the game, however briefly and, in the context of the game, meaninglessly? Note too that some caution needs to be exercised when interpreting the strict statistical significance of interarrival time sequences that are, like this one, quite short, as the statistical properties of the runs metric relies on asymptotic behaviour. It's also possible, though rare, for both teams in the same contest to exhibit bursty Scoring behaviour. There are only 14 examples (about 1%) of such games in the data, one of which is the bi-bursty Melbourne v Port Adelaide clash from Round 9 of 2010 where Melbourne prevailed 17.9 (111) to 16.14 (110).. 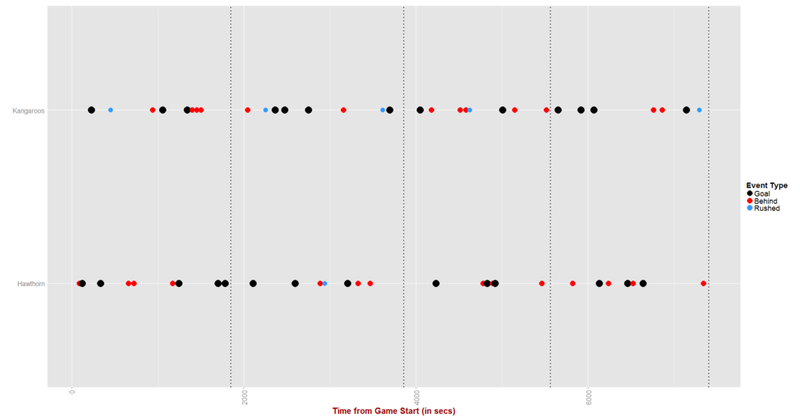 In this game Melbourne managed a string of six below-median interarrival times for Scoring Shots, followed immediately by a string of four that were above-median and then, to finish the game, a string of seven times that were below-median. Port Adelaide, for its part, recorded a set of four successive above-median times and then, later in a game, a string of six more above-median times followed by a string of nine below-median times. Lastly, an example of a game far more typical from a burstiness viewpoint - one of the 80% of contests in which neither team's Scoring Shot production allows us to reject the assumption that the Scoring Shot production rate is constant across the entire game. In this game, a Round 5 clash from 2013, Hawthorn defeated the Roos 14.15 (99) to 13.18 (96), with neither side stringing together a sequence longer than three Scoring Shot intervals of above-median or below-median status. So, for four games out of five, neither team's Scoring Shot production times can be statistically differentiated from sequences generated from a process spitting out Scoring Shots at a constant rate - perhaps a Poisson process or something like it. This perhaps explains why a Poisson distribution does a reasonably good job of modelling team Scoring Shot production though it is not perfect. And, in about another 20% of games, only one of the two teams on the paddock generates Scoring Shots at rates that seem to vary across the duration of that contest. Just 1 game in 100 sees both teams exhibiting what I've defined as momentum in Scoring Shot production during the game. I'm sure this is not the last word I'll have on the topic on in-game momentum - I'd like, for example, to look at the effects of one team's scoring on the other team's, a phenomenon that's not considered explicitly in the current analysis - but I do like the nuanced interpretation that this analysis has afforded. Yes, there is sometimes momentum in Scoring Shot production, but it's not present in the vast majority of games - at least to the extent that it's detectable by the statistical test I'm using - and it only very rarely strikes both teams during the course of a single contest. Someone wanting to prosecute an argument that momentum in scoring is far more prevalent than I've detected here might suggest that another way of operationalising the concept of momentum would lead to a different conclusion. I think that's true, and I plan to explore the idea in future blog posts. IS THERE A BURSTINESS BOUNTY? There's no a priori case that can be made, I'd suggest, for the virtues or vices of bursty scoring. A team that scores in bursts during a game is, at least, scoring, but the length and quality of that burstiness will be what ultimately matters, and a bursty team with a very low base rate of Scoring Shot production will still get thumped by a bursty-averse opponent that generates Scoring Shots, tortoise like, every 2 minutes. The winning percentages for each of these circumstances appear as the first four columns, in order, in the table. On the far right are the team's overall winning rates at home and away for comparative purposes. It's a pretty mixed story for the benefits or otherwise of burstiness. Exhibiting burstiness when playing at home has been associated with meaningfully superior performance for GWS, Melbourne, St Kilda, Essendon, Gold Coast and the Roos in that they've won substantially more often than their base rate when they've been bursty at home compared to when they've not. For the Collingwood, Richmond, West Coast, Hawthorn and Sydney however, burstiness has been associated with generally poorer outcomes. Away from home, only Geelong can point to having achieved much greater success when being bursty than when not, while Richmond (and maybe Carlton) can lay claim to having done less well on the road when they've been bursty. Opponent burstiness has hurt GWS, Essendon, the Gold Coast and the Kangaroos at home, while helping the Lions and the Saints. Finally, when playing away from home, opponent burstiness has been associated with substantially lower winning rates for Fremantle, Geelong and the Gold Coast, and with much higher winning rates for Essendon, the Western Bulldogs and Adelaide. There's no universal assessment you can make on the basis of this analysis then about the association between success and one's own or one's opponent's burstiness. It's a team-by-team thing and even then the effects of burstiness for the same team vary depending on venue. In-game momentum, as I've defined it for the purposes of this blog, which is as burstiness in Scoring Shot production detected by assessing the runs behaviour of Scoring Shot interarrival times, appears in about 1 game in 5 and only rarely visits itself upon both the participants in a single contest. For about 80% of all the games played since 2008, one can't statistically differentiate the Scoring Shot production rates of the two teams from those that might occur if the rate of Shot production were constant across the entire game - that is, if there was no momentum as I've defined it in Scoring Shot production for either team. When burstiness in Scoring Shot production does manifest for a team it's neither universally beneficial nor definitively detrimental. The size of the effect, if any, on the winning propensity of a team enjoying or enduring burstiness varies by team and by venue.